R S Brothers - A well-known brand for wedding shopping and jewellery for the entire family now near ECIL! Monte Carlo - City Center Mall now has a new store. Wallet ready? JadeBlue - Wedding collections for men now in a plush store in Banjara Hills. 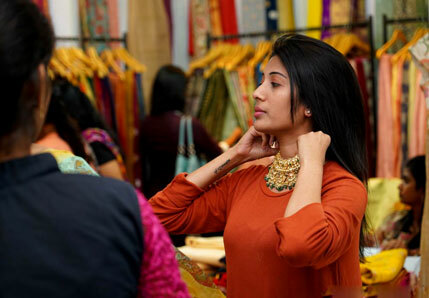 Provogue - Get trendy in Inorbit mall. CMR Shopping Mall - Shop for wedding wear and more in Kothapet now. Arzu - Ladies Ethnic - Women get ready to get pampered. Search Shops e. g. "bicycles", "chandana dilsukhnagar"
There's more to Hyderabad's shopping scene than Lad Bazaar. Here are the city's hottest stores and shopping destinations.